More numbers in the real world! 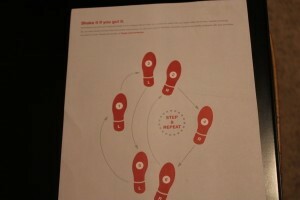 Dance steps! Just think what terrible, horrible, no good, very bad dancers we would be if dance steps weren’t numbered. We wouldn’t know what foot to move when. We would have to learn by watching and who wants to do that when you can learn by looking at a numbered diagram? Of course, it’s not enough to know when and where to move a particular foot; in order to be super good dancers, we have to COUNT to the beat of the music. Numbers and dancing go hand-in-hand just like Fred and Ginger. 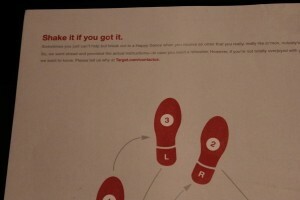 Here’s instructions on how to dance the Happy Dance, courtesy of Target. These instructions were included in a mail order for a crib. Buying a crib made me happy. Doing this dance made me happy. Putting up the crib — not so happy on that one.